With fall camp underway and the entire 105-man roster now practicing, we can look deeper into the questions surrounding the 2015 Oregon Ducks. The team lost a lot of experience and productivity when several teammates graduated, and the 2015 Ducks will have to replace them. Many names that were staples on both sides of the ball over the last few years are now gone, and a new flock of talent is ready to make a name for itself. Here are three players Oregon fans will know well by the end of the 2015 season. Benoit scored a lone touchdown in 2014. Kani Benoit: The redshirt sophomore won’t be in the starting lineup, but he has a good shot of receiving valuable minutes as the No. 2 back. Since Thomas Tyner’s shoulder surgery will sideline him for the entire 2015 season, Oregon will need someone else to step up and help lighten the load on Freeman. Benoit is entering his third year at Oregon, so he knows the system and what is expected of the position. Prior to 2015, Benoit was buried in the depth chart and his time on the field last year came sparingly in garbage time. This season could be the time for Kani to make a name for himself. According to reports, over the course of spring ball and summer workouts, Benoit has slimmed down and toned up. If he has put in the work that has been reported, it is an obvious sign he isn’t going to let this opportunity pass. Yes, Tyner’s injury was a big blow to the big picture — but fans should know that Oregon always has another running back ready to step up. 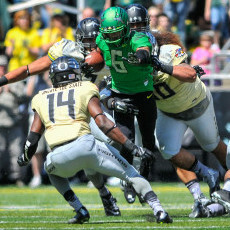 That player is now Benoit, but even casual Oregon fans will know his name shortly. Brown saw reps as a true freshmen in the 2014 Spring Game. 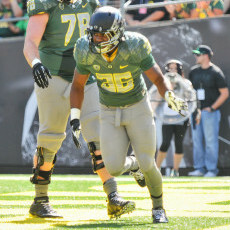 Jalen Brown: The redshirt freshman is entering his second fall camp at Oregon. Along with the running backs, the wide receiver position is deep this year, as evidenced by Brown (an Army All-American game selection in 2014) having to redshirt as a true freshman. — Is Devon Allen full go after tearing his ACL in the Rose Bowl last January? Is Darren Carrington going to be suspended for fewer than the first six games of the season? Brown may not be in the starting lineup for Week 1, but he could be the fourth or fifth guy in the rotation throughout a game. Brown is an athletic, talented receiver with a great opportunity in front of him. If he can make his way into the receiver rotation, he can make a big impact on a game — all 6’1″, 200 pounds of him. Ugo Amadi: This true freshman may have the best shot at starting of these three players. The secondary lost both starters and one backup to graduation. With Chris Seisay the expected starter on one side at cornerback, there is an open position opposite him. Amadi was one of six freshmen to enroll early last January, and that could be very beneficial. He will battle sophomore Arrion Springs throughout the duration of fall camp for that lone open position — one of the biggest battles going into fall camp (something I alluded to in my last article). Once again, Amadi has a chance most other freshmen rarely get. Lack of depth at his position and early enrollment could be a recipe for Amadi to earn valuable playing time and potentially a starting job early. Ugo Amadi prepares to make a tackle in the 2015 Spring Game. All three of these players have great opportunities in front of them. They are young, but Benoit and Brown have been through two seasons already and Amadi could play immediately. 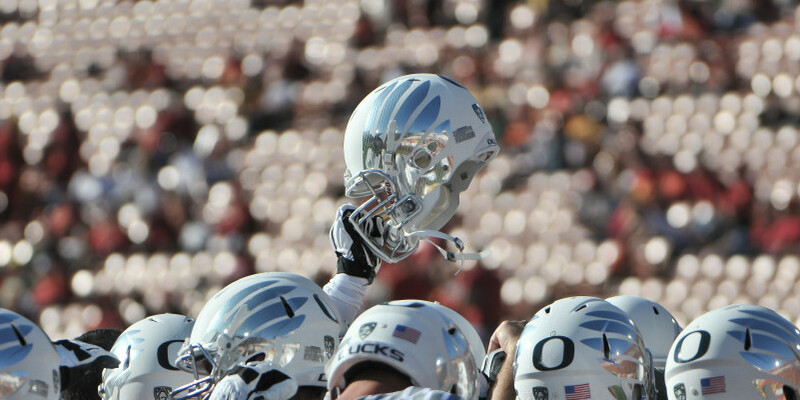 They all know the Oregon way, they all know the system, and it now it comes down to production. If Benoit, Brown and Amadi can continue to impress, they could start the next wave of household names for Oregon football.